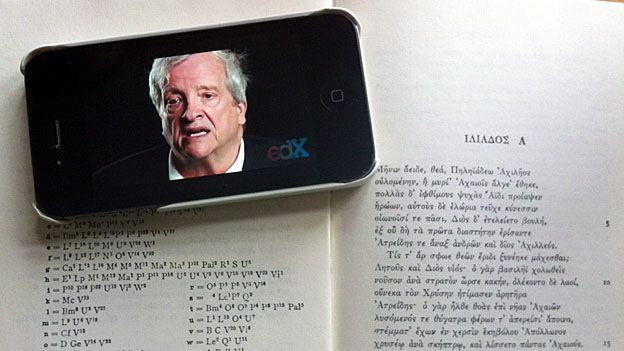 Oxford University has announced its first “massive open online course” – or so-called Mooc – in a partnership with a US online university network. These free online courses have grown in popularity with hundreds of universities and millions of students. But until now Oxford has not offered such Mooc courses. It is going to run an economics course partnered with online platform edX, set up by Harvard University and Massachusetts Institute of Technology. The emergence of Mooc courses in recent years has been a major phenomenon in higher education, particularly in the United States. Their supporters argued that putting courses online would make them more accessible and affordable – while sceptics doubted that teaching and the exchange of ideas in seminars could be replicated on the internet. They also warned of the high drop-out rate from Moocs and that students were unlikely to get a full degree. Oxford has now announced that it will begin enrolling students for a course starting in February 2017 called “From Poverty to Prosperity: Understanding Economic Development”. It will be part of the edX online platform, which has nine million registered students and runs more than 900 online courses from universities including Harvard, MIT, Berkeley in the US, Peking in China and Sorbonne in France as well as Edinburgh and Imperial College London in the UK. The course will examine the role that governments play in boosting economic development and will be led by Sir Paul Collier, professor of economics and public policy at the Blavatnik School of Government. In 2012, the New York Times declared that this was “the Year of the Mooc” – suggesting that the internet would revolutionise higher education in the way that the digital world had shaken up business and the media. Moocs – or massive open online courses – were intended to tackle some of the big challenges in higher education, such as the high cost of fees and that universities remained out of reach for people who could not spare years out of work. They would be free and everything would be delivered online, so that large numbers of students, anywhere in the world, could be reached by a single course. Hundreds of universities began to experiment with these short online courses, which are often delivered through online platforms, such as edX, Coursera and Futurelearn. These courses have attracted millions of students, but so far they’ve been very unlikely to give students any formal qualification. There might be a certificate to show a student has completed the course, but these are not degrees. You can’t take a Mooc and say you’re a graduate of that university. But since the dawn of the Moocs there has been an expectation that these online courses from top universities could develop into fully-fledged degree courses. So far this has been a cautious process. Leading universities are offering some fully online postgraduate courses and there have been experiments with Moocs being used as credits counting towards degrees. But there has been less enthusiasm to offer fully online undergraduate courses, with concerns about how you could teach and supervise over the internet. Of course distance learning specialists, such as the Open University, have been doing this for years. There has been some scepticism about how traditional universities could move online. But the arrival of the University of Oxford will be seen as adding to the credibility of the Mooc movement. Ngaire Woods, Blavatnik’s dean, said the online course would be “an effective way to expand access to knowledge beyond the classrooms of Oxford”. Prof Woods said the school was dedicated to improving government and that depended on “better educated public officials, teachers, entrepreneurs, journalists and citizens”. The head of the Coursera online network, which has more than 20 million students, recently predicted that within five years many top universities would be offering fully accredited undergraduate degrees taught entirely online.